IVF is celebrating its 40th birthday, with over 300,000 children now successfully conceived in the UK. Each and every day, families across the country celebrate this miraculous chance to start a family. However, 40 years on and there is still a glaring omission in IVF law: the welfare of women. For some women, this life-changing opportunity comes with life-changing consequences. 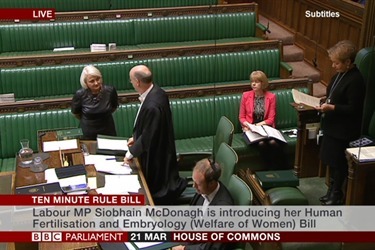 And so Siobhain is calling for an explicit commitment to women's welfare to be added to the Human Fertilisation and Embryology Act, bringing forward a Bill to Parliament calling for the law to be amended. Siobhain's Bill seeks an explicit commitment to safeguard the welfare of women in relation to the effects of marketing and advertising, the emotional effects, and the financial effects of IVF. It calls for the Human Fertilisation and Embryology Authority to be required to collect information about all drugs and dosages administered to women during IVF and early pregnancy. And it aims to link the Human Fertilisation and Embryology Authority's registry with hospital, cancer and death registers. This is particularly important in light of the evidence that drug protocols can cause women such extremely adverse health effects. The Bill is now ready for the Second Reading in Parliament.